Happy Friday, everyone! I have nothing finished this week because my knitting time was practically nonexistent, but I do have a little progress to show! BMFA Socks That Rock Lightweight, colorway Melusine and some Bugga in Blue Lobster for contrast. 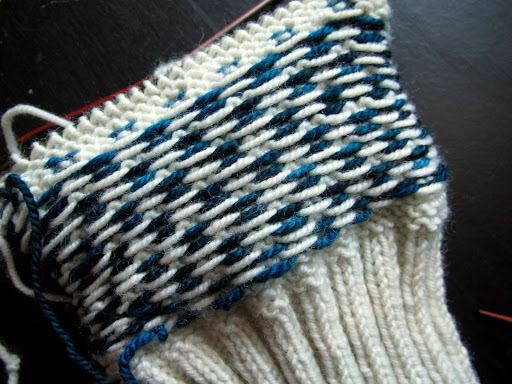 That is the beginning of the second Tour-de-Sock pattern, Chicane Socks by Debbie O’Neill. I debated earlier in the week whether to knit the second sock of the first TDS pattern and (obviously) decided to start the new sock. For one, I’ll take almost any excuse to start a new project, the beginnings of projects are my favorite parts. For another, I feel less guilty about all my stash yarn when more of it’s currently in use. And finally, by the end of TDS I’m going to have a pretty difficult time ignoring all of the gorgeous half-finished pairs of socks lying around, so the motivation to finish them should be strong minus the feeling of repetition that sometimes happens when I knit one sock right after the first. This was my first time knitting any sort of colorwork that involves a significant number of floats on the back of the fabric (those long strands of yarn you see there). I was pretty anxious about keeping them loose since carrying the unused strand behind the work tightens up the fabric and in a sock that needs to stretch over the heel, that’s not great. In fact, a sock with a too-tight-cuff is pretty much the worst thing ever. To help prevent this I went up a needle size, cast on more stitches than I usually use with this yarn (72 instead of 60-66), knit CRAZY LOOSELY especially when going from the end of one needle to another (give the float a little tug with your fingers after you knit the next stitch so it doesn’t snug up too much between DPNs), and I elongated the ribbing and shortened the leg overall so the colorwork part would hit lower on the calf when worn, which works better for my short and stout legs… in theory. I have no idea if any of that will help yet but the fabric seems like it has a decent amount of stretch so here’s hoping! Anybody have some good colorwork tips? 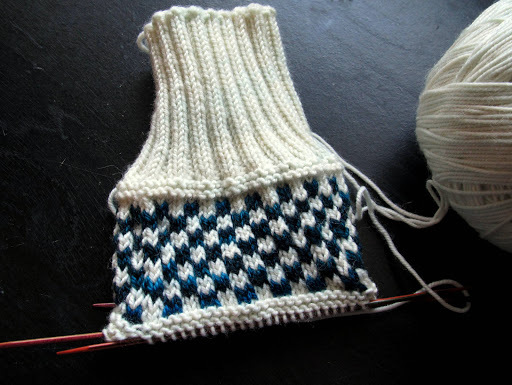 I think the third TDS pattern is going to involve much more colorwork so I’m all ears. This entry was posted in BlueMoon, Bugga, socks, STR, TDS by shoelaceswitcher. Bookmark the permalink.